I’m afraid Monty Python has ruined me for seeing things parrot-ish as anything other than the Dead Parrot sketch. Ha! I’m not in the least surprised. Beautiful vintage feel to the piece – love it in color! The warning label is perfect. Thanks for the clarification this time, Sarah. 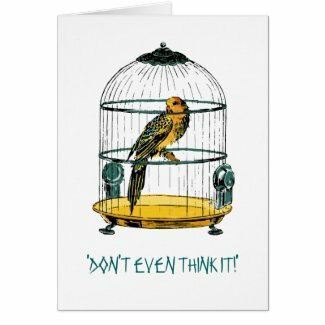 The expression on the parrot goes well with the warning message on the card. I like to admire these birds from afar, having fallen victim to their powerful beaks in the past! I do think it works well either coloured, or as a black and white drawing, and is suitably quirky. Thanks, Pete! I won’t go near them. Beautiful and bright. And love the quote!